SIGMATEK offers with the slim, modular system S-DIAS Safety, an economic solution with safety functions can be flexible, easily and scalably implemented. Core of this system is the SCP 111 Safety controller. Combined with the safe digital mix module SDM 081 with six digital inputs and two digital outputs, a freely programmable mini safety system – within a control cabinet width of only 25 mm – is provided. Functions such as emergency stop, door contact, light grid or operating mode select switch can be thereby implemented. 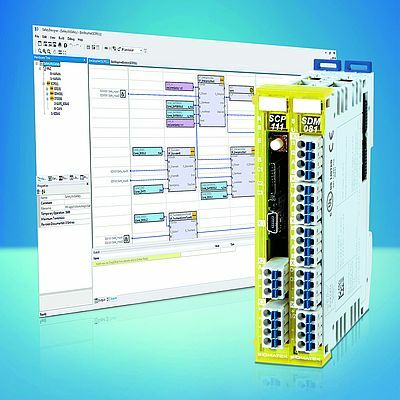 Further safety-oriented I/O modules are available in the S-DIAS portfolio for complex safety applications: The SDI 101 with ten digital inputs, the STO 081 with eight short-circuit proof, digital outputs, the relay module SRO 021 with two relay outputs, as well as the SSI 021 for analysis of two absolute value encoder signals (up to 32 bits). The application is comfortably programmed in the graphic editor of the LASAL SAFETY Designer. In the integrated library, Safety function blocks based on PLCopen are provided – which include for example, emergency stop, two-hand control or guard locking. Designed for the highest Safety requirements (SIL 3, PL e, Cat. 4), the TÜV-certified Safety system can be fully integrated into the S-DIAS control system. The flexible combination of safe and function-oriented modules enables individual adaptation to customer requirements. S-DIAS Safety can however, be used as a stand-alone solution.